Why do I have slow and sleepy wasps indoors? Jump Menu: Why do I have slow and sleepy wasps indoors? Are wasps a danger to pets? How big do wasp nests get? If you have wasps getting inside your home and they are slow and unable to fly, they are starving. It takes a great deal of energy to fly and a good food source to provide that energy. You usually will have lethargic wasps getting indoors in late autumn. You had a nest that went unnoticed, and it is now dying due to diminishing food supplies for the wasps. If you can find where they are getting in, use packing tape to block the entry point to prevent them from gaining access to the inside of your home. Hoover up the remaining wasps and this should stop the problem. Are wasps a danger to pets? 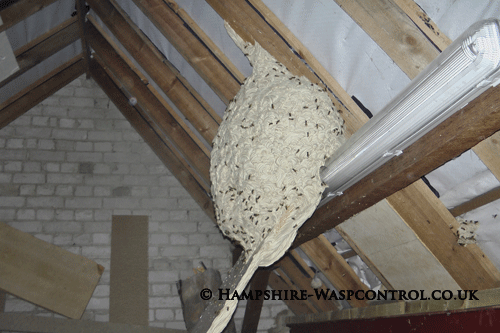 Wasps are highly defensive of their nests and can attack anything that approaches the nest location. Dogs are at risk from individual stings due to their nature to chase things, and many dogs instinctively try to bite insects and can get stung in their mouths which can be particularly dangerous. Horses are also at risk, as wasps like to nest in stables. Horses can also be at risk if there are nearby honeybee hives, and there have been several cases of horses dying from continued attacks from honey bees. How big do wasp nests get? The size of wasp nests depends on the season. In some years nests get larger than usual. In an average year, at the end of the summer when the nests are full size, they can be three feet in diameter. Not all nests are round, and wasps can build their nests any shape to fit in with the surroundings. A massive nest can grow to four or five feet in diameter, but this size of nest is quite rare.